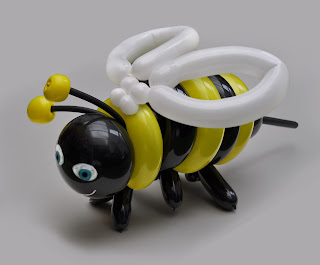 I have decided to continue the creepy crawly theme today with a bumblebee, This little chap is made from a mixture of balloons, mainly 260s, there are 10 balloons in total. I started with a black round balloon for the face and joined it to a black 360 for the central core of his body, the rings were added next from 2 yellows and 1 black 260, I then made a tulip twist in the 350 to make his tail and sting. His antennas are a black 260 and a yellow 260, his legs were added next and they are 2 black 160s, finally I added the wings (which I nearly forgot) from a white 260.